Life vests are very important pieces of equipment to have around whenever you are engaging in water activities. A great quality life vest will properly meet all Coast Guard regulations and be well made and comfortable to wear. It will also have the proper closures to keep it snug and safely in place. Our top pick, the Onyx MoveVent Dynamic Paddle Sports Life Vest, is a perfect example of a well-made life vest that provides the safety you need when engaging in water activities. Water activities can include water skiing, boating, canoeing, whitewater rafting, kayaking and others. Even people who know how to swim can benefit from life vests. There are many different types and styles of life vests on the market these days to choose from. They come in a variety of colors and sizes from infant to adult. Life vest wearing needs to meet safety regulations to be considered safe to wear around water. You need to know what these regulations are so you and your children and others you are with are safe whenever you are engaging in water activities. There are certain factors you need to look at when choosing the right life vest for your needs. These considerations include weight, body fat and chest size as well as other factors. This buyer’s guide is designed to help teach you those factors and considerations so you are not overwhelmed by the choices out there. This information will help you sort through all the different life vests and select the life vest or vests that will meet your needs perfectly. This form fitting life vest is very comfortable to wear around the water for boating and other water activities. It features mesh in the lower back area that allows for air circulation and fits high back seats comfortably as well. The neoprene comfort pads in the shoulders can be adjusted to fit properly and comfortably. The expandable pockets feature zippers and mesh drainage to keep your belongings safe. The ONYX movement life vest is made from 200D ripstop nylon for maximum durability and it is lightweight too. The SOLAS reflective material provides plenty of visibility which adds to the safety factor. It comes in either M/L sizes or 2XL/3XL and is not designed for children since it will more than likely be too big. The vented channels this life vest has reduces overheating. 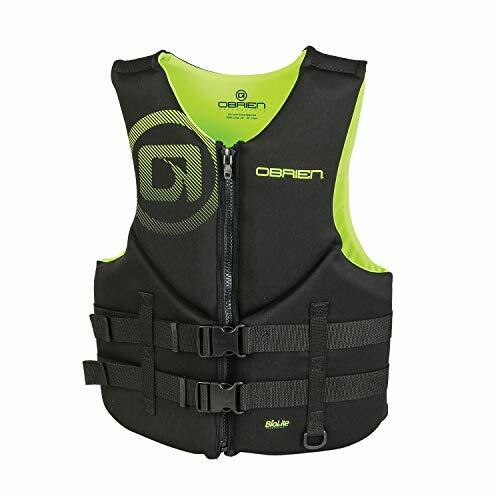 Stay safe in extreme comfort with the O’Brien Traditional Neo Life Vest. It features a neoprene outer layer for maximum comfort. There is also a zip closure and 2 belts that provide even more security. Remember that the neoprene life vests will fit a lot more snugly when they are dry. You want them to fit snugly when dry because the vest expands when it is wet. This life vest is USCG approved. One of the most popular features of this life vest is that it does not restrict the movement of the wearer so it is the perfect life vest for kayaking, whitewater rafting, boating and other water activities. Sizes include XS, S, M, L, XL, 2XL, and 3XL. These are men’s sizes so the measurements would need to be adjusted accordingly for women to get the right size. Color choices include black, black and yellow, blue and red. This adult Classic Series life vest by Stearns is a type III life vest, and is Coast Guard approved. The shell of the vest is made from 200D nylon for long lasting durability. It has three adjustable belts that go around the chest that keep the life vest comfortable. The PE foam inside adds to the comfort level this life vest provides. This Stearns life vest is perfect for wearing for a day on the boat. It is available in Universal and Oversized and can come in blue or red for easy visibility. The straps used to secure this life vest are webbed, 1” straps. 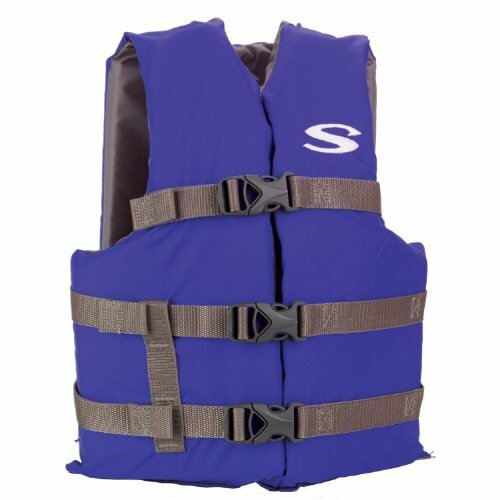 With proper care, this is a life vest that will last a long time so you can enjoy time around the water in a safe manner. Life vests should always be a part of water activities such as boating, waterskiing, kayaking, rafting and more. There are many different kinds of life vests on the market so choosing one can be a challenge if you are not familiar with the different types, styles, safety classifications and other important factors that play a part in the life vest you choose. All three of the life vests that we have reviewed above are great examples of high quality life vests that will protect the wearer from water dangers. If you don’t see the kind of life vest you want in the three above, read the buyer’s guide below to learn even more about choosing the right type of life vest. This information will help you understand what a life vest needs to have in order to be truly safe in the water. This information will make sorting through all the different types and styles much easier so you can choose the right styles, sizes and levels to keep yourself and your family safe and enjoying the water activities season after season. There are several different types of life vests on the market that are suited to various water activities. We have listed these types below along with some information about each of them. Life vest for fishing – This life vest can be worn in a kayak, whitewater raft, or canoe comfortably. Paddling is much easier thanks to the wider cuts that are around the arms. It is also great for fishing since casting and reeling movements are not restricted. This type of life vest has tool hangers and loops on it for fishing gear. It is most often a type III PDF. Life Vest for Kayaking/Canoeing – This vest also have a lot of freedom of movement and makes paddling easy. There is usually a much thinner backing made of nylon with this type of life vest and is comfortable to wear even when sitting in a kayak. This life vest is rated a type III vest most often. Compliance Life Vest – These durable and simply designed vests are compliant with all US Coast Guard regulations for recreational boating. It is most often rated a type II PDF. This life vest is made from foam and has one single strap to keep it in place and secure. Life Vest for Waterskiing and Tubing – This specialty life vest is snug fitting and has wide cut arms for waterskiing and tubing movements with the arms so they are not restricted. They also work well for kneeboarding and wakeboarding. These foam vests have several buckles that ensure a snug, comfortable fit. This is a type III PDF. Life Vests for Youth – These are usually made for kids that weigh between 50 and 90 pounds. They are designed for children and fit boys or girls equally well. They are a good choice for paddle sports and any kind of recreational boating. Life Vests for Toddlers – This children’s life vest works well for children that weigh 30 to 50 pounds. They are a good choice to use for any recreational boating activities. They are also good for getting a child used to the water and can help alleviate fear of the water. Life Vests for Infants – these vests are good for babies up to 30 pounds. The shorter design of these vests allows new swimmers to move around with ease while being comfortable as well. These vests have a single zipper in the center and two buckles that ensure the vest stays in place. The different types of ratings that life vests have, means that they meet certain legal requirements of the US Coast Guard for PDFs or personal flotation devices. The four different types are I, II, III, IV or V PDF and should be clearly marked. Type I – This is for offshore use and provides the most flotation ability or buoyancy. It is very effective for all different typed of water where it might take a little bit of time for the person to be rescued. This life vest is made of foam and can hold a buoyancy of as much as 22 pounds. This type I life vest is the most popular and is easy to put on. It is reversible as well. 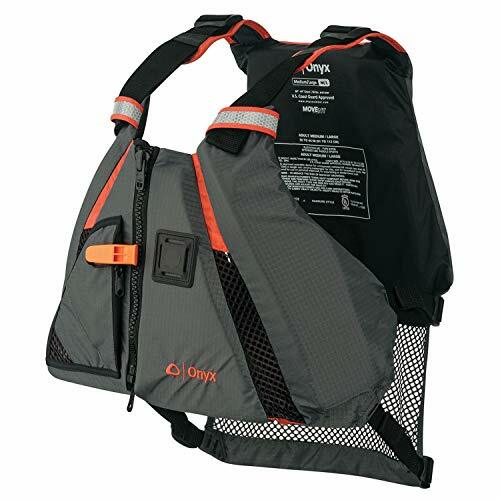 Type II – This type of life vest is best suited for calm waters where rescues are very fast. This life vest will not automatically turn an unconscious swimmer’s face out of the water and only has 15 pounds of buoyancy. Type III – This type of vest is not really a vest but it is a flotation device. It is the best vest to choose for boating activities where the user wears the life vest for extended periods of time. Type IV – This “vest” is a throwable device that can be tossed to a conscious person that is in the water. It is designed to be held onto until the person is rescued. It is not a vest that is worn and should be used a long with a regular life vest. The type IV device is best suited for calm waters that are inland where heavy boat traffic can ensure quick rescue. This device has 16 to 20 pounds of buoyancy. Type V – This device’s uses are labeled on the device itself. It should not be used for anything other than what is specified. It is a specialty item. Life vests are most commonly made from either nylon or neoprene. Each has its own advantages and benefits. We have listed those below. Neoprene – This life vest is most often used for water sports activities like waterskiing, tubing, wake boarding, etc. It is usually more expensive than nylon and provides users with a tight, snug fit and higher amounts of buoyancy that will keep the wearer afloat for longer periods of time if necessary. Nylon – Nylon life vests are most commonly used for paddle sports. They are less expensive than life vests made with neoprene and are lightweight and comfortable for the wearer to use when fishing and paddling since there is more room in the arm area. There are some extra features that a life vest has that make them even nicer to wear. These features can increase the benefit to wearing the life vest. How much the features benefit the wearer will depend on what activities they are engaging in while wearing it. Pockets – pockets are great for a life vest that is worn for fishing trips and for collecting shark’s teeth, shells and rocks. The pockets also provide space for fishing gear. They usually have loops and tool hangers as well. Reflective tape – If you do any nighttime boating or are out in low-visibility conditions, reflective tape will enable you to clearly be seen. This is a major boost to the safety of being out at night. Neon and Bright Colors – Bright colors allow the wearer to be seen much more easily in open water. Sometimes, wearers just like having the bright colors and it is a fashion choice. Ventilation channels – These are great for those who are engaging in kayaking, canoeing, rafting and other paddling water sports. The channels help keep the paddler cooler than if they didn’t have air flow underneath the vest. Life vests are an important part of participating in water activities. They should always be worn when boating, even if you know how to swim and children should ALWAYS have a life vest on. Choosing the appropriate life vest for the activities you participate in can help increase your safety when you are out of the water. The three life vests reviewed above are all excellent choices for staying safe. They are type III rated and come in various sizes and color choices. If none of these are what you are looking for, use the information in this guide to sort through the different types of life vests on the market so you can choose the type of vest that will be perfect for your needs and activities.